Of course, the excitement of the broker equates to the despair of the client. My purpose in writing this book is to show you how to avoid becoming a victim to either an unscrupulous broker or to your own self-destructive behavioral tendencies that draw you into speculating, more generally known as active investing. 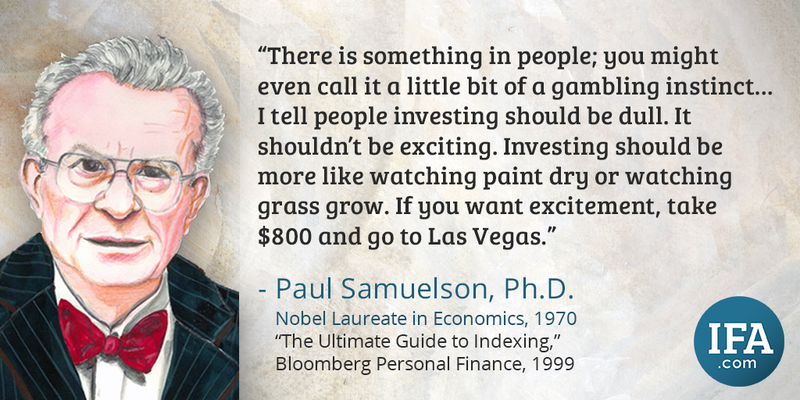 This better way to invest is simply passive investing with index funds. This 12-Step Recovery Program for Active Investors will walk you through the land mines and pitfalls of active investing and show you a better way to invest. When you complete this 12-Step Program, you will understand the differences between speculating versus investing, and become aware of the emotional triggers that impact short-term decisions. You will also obtain an enlightening education on science-based and rules-based investing that may forever change the way you perceive how the stock market works. You will learn the hazards of speculation and the rewards of a disciplined investment strategy. The best part is that you can change your own investment behavior, which can lead to a more profitable and enjoyable life. Emotions often override reason when it comes to investment decisions, leading to irrational and destructive behavior. The financial news media and Wall Street feed the fear, anxiety and other stressful emotions experienced by investors, resulting in less than favorable investment outcomes. This book will teach you how to hang on in the midst of market turmoil so you can earn the long-term returns of capitalism. Watch Step 1 from the documentary film Index Funds: The 12-Step Recovery Program for Active Investors. Active investing is a strategy investors use when trying to beat a market or appropriate benchmark. Active investors rely on speculation about short-term future market movements and ignore the lessons embedded in vast amounts of historical data. They commonly engage in picking stocks, times, managers or investment styles. As later steps demonstrate, active investors who claim the ability to outperform a market are in essence claiming to divine the future. When accurately measured, this is simply not possible. Surprisingly, the analytical techniques that active investors use are best described as qualitative or speculative, largely including predictions of future movements of stocks or the stock market. Bottom line, these methods prove self-defeating for active investors and actually lead them to underperform the very markets they seek to beat. The first step in any 12-Step Program focuses on recognizing and admitting a problem exists. In this case, this means identifying the behaviors that define an active investor. There are sharp contrasts between the behaviors of active and passive investors. Passive investors don’t try to pick stocks, times, managers or styles. Instead, they buy and hold globally diversified portfolios of passively managed funds. The term “passive” translates into less trading, more favorable tax consequences and lower fees and expenses than actively managed strategies. A passively managed fund or index fund can be defined as a mutual or exchange-traded fund (ETF) with specific rules of construction that are adhered to regardless of market conditions. An index fund’s rules of construction clearly identify the type of companies suitable for the fund and the trading rules to implement the fund. Equity index funds would include groups of stocks with similar characteristics such as size, value, profitability and geographic location of a company. A group of stocks may include companies from the United States, international developed or emerging countries. Additional indexes within these markets may include segments such as small value, large value, small growth, large growth, real estate and fixed-income. Companies are purchased and held within the index fund when they meet specific index parameters and are sold when they move outside of those parameters. Think of an index fund as an investment utilizing rules-based investing. Figure 1-1 illustrates the different characteristics between active and passive investing. Introduced in the early 1970’s, index fund investing has caught on, and for good reason. As the chart shows, index fund investors have fared better in returns and incurred lower taxes and turnover than active investors. They are also able to invest and relax. As the head of the Gambling Disorders Clinic at Columbia University, Dr. Carlos Blanco has a lot of experience with gambling addicts, and he says one difference between obsessive active investors and chronic gamblers is the age in which the disease is most prevalent. Pathological gamblers are typically in their late teens and early 20’s while people who are addicted to speculating in the stock market are commonly in their 30’s and 40’s. According to Christopher Burn, a gambling therapist at U.K.-based Castle Craig Hospital, development of intensive evidence-based therapies to treat compulsive stock trading and online ‘day trading’ are poised to become two of the biggest behavioral health issues challenges in the decades ahead. Behavioral finance is a field that studies the connection between investors’ emotions and their financial decisions. In The Little Book of Behavioral Investing: how not to be your own worst enemy3, author James Montier talks about the importance of planning ahead to protect us from the “behavioral biases that drag down investment returns.” He highlights the need for investors to pre-commit to an investment strategy in order to avoid the pitfalls of emotional decisions. Even wealthy individuals struggle with emotions management and investing discipline. A Barclay’s study6 found that 41% of high net worth investors wished they had more self-control over their investing decisions. 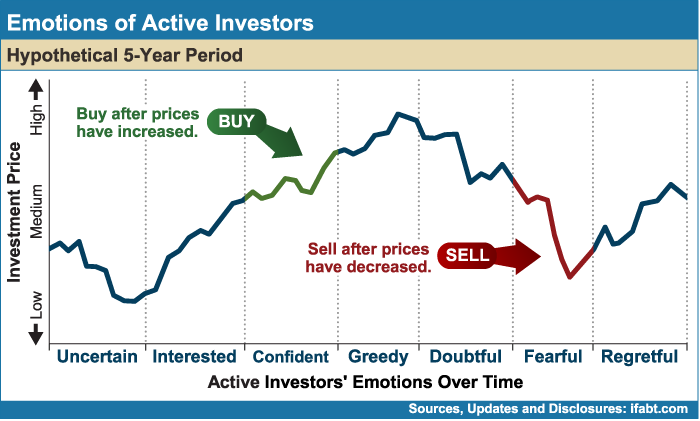 The study concluded that emotional trading can cost an investor about 20% in returns over the 10-year period studied. Investors who prevented themselves from over-trading through specific strategies were on average 12% wealthier than those who did not use self-control mechanisms. These self-control strategies include minimizing time spent checking their portfolios or seeking advice prior to making a buy or sell decision. Overconfidence: People mistakenly believe they can outperform the market. Hindsight bias: Investors think past events were predictable and obvious and believe they should have known better, when in truth, news is what moves the markets, and past events could not have been predicted in advance. Familiarity bias: Investors invest only in stocks they know, which provides a false sense of security. An example may be a “legacy” stock that’s been passed down in a family through generations. Geographical bias also comes into play when investors choose stocks of companies headquartered in their state or region of residence, which can lead to undiversified investments. Regret avoidance: Investors vow to never repeat the same decision if it resulted in a previous loss or missed gain, not accepting that the future cannot be predicted. 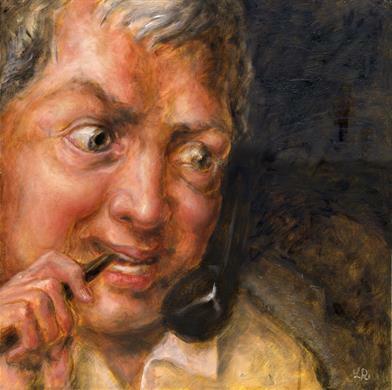 Self-attribution bias: Investors tend to take full credit for investment gains and blame outside factors for losses, wrongly attributing success to personal skill instead of luck. Extrapolation: Investors base decisions on recent market movements, assuming the perceived trend will repeat. These behavioral biases cause investors to believe they have control in areas where they actually have little or none. A disciplined, rules-based investing approach involves the understanding of the factors we can and cannot control, planning ahead and not giving into emotions when making investment decisions. Figure 1-2 depicts the roller coaster of emotions active investors experience. In the emotional cycle, they wait until they feel confident their selected investments are on a perceived upward trend; then they place their orders. But once prices have fallen, doubt sets in. When that doubt turns to fear, they often sell the investment, resulting in a loss. In contrast, Figure 1-3 shows the relaxed emotions that indexers enjoy by accepting market randomness and relying on investing science instead of making decisions based on emotions. Passive investors invest regardless of market conditions, because they understand that short-term volatility is unpredictable. They know that succumbing to gut instincts and emotions undermines long-term wealth accumulation. They also know that news about capitalism is positive on average, but involves some stomach-churning volatility. In order to regulate their risk, passive investors also engage in periodic rebalancing and are rewarded over time for their discipline. 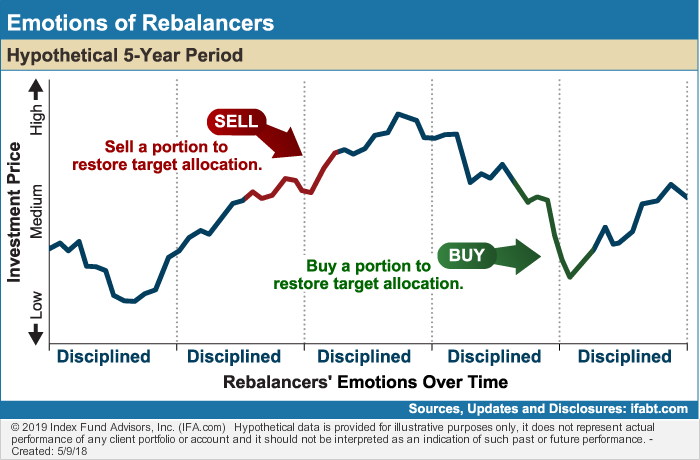 Figure 1-4 depicts the disciplined emotions and approach of “Rebalancers” who sell a portion of their funds that have grown beyond their target allocation and buy more of other funds to restore their target allocation. This is actually the opposite behavior of active investors, because rebalancers will sell a portion of their portfolio after it has gone up and buy more of those investments that have declined in order to maintain a target asset allocation. This strategy seems counter intuitive and can be emotionally difficult to implement. Rebalancing requires discipline and ensures that a portfolio will remain at a relatively constant level of risk. The impact of emotional triggers on investor performance is a subject of much analysis. An annual study called the Quantitative Analysis of Investor Behavior (QAIB),7 which has been conducted by Dalbar since 1994, attempts to measure the impact of investor decisions to buy, sell and switch into and out of mutual funds. Each year the study has shown the average mutual fund investor earns significantly less than the actual mutual funds. “No matter what the state of the mutual fund industry, boom or bust: Investment results are more dependent on investor behavior than on fund performance,” a recent QAIB concluded. The report issued in April 2018 reiterated this finding, concluding that poor investor behavior caused the average equity mutual fund investor to underperform the S&P 500 index by 1.19% for the year 2017. 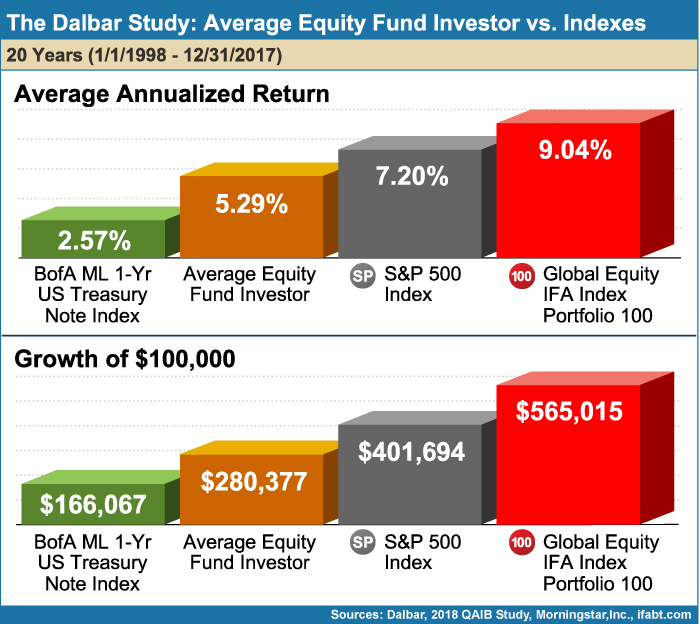 Figure 1-5 illustrates the results of the 2018 Dalbar study, which includes a comparison of the returns of an average equity fund investor to the returns of the market from 1998 through 2017. Permitting their decisions to be driven by short term volatility, the average equity fund investor earned returns of only 5.29%, while a buy-and-hold investment in the S&P 500 returned 7.2%. An investment of $100,000 made in 1998 grew to $280,377 over the 20-year period for an average equity fund investor, while the same amount invested in the S&P 500 grew to $401,694. Even better, an investor who owned an all-equity, small value tilted, globally diversified index portfolio would have grown a $100,000 investment to $565,015. Clearly, investor behavior can have a far more negative impact on investments than investors realize. 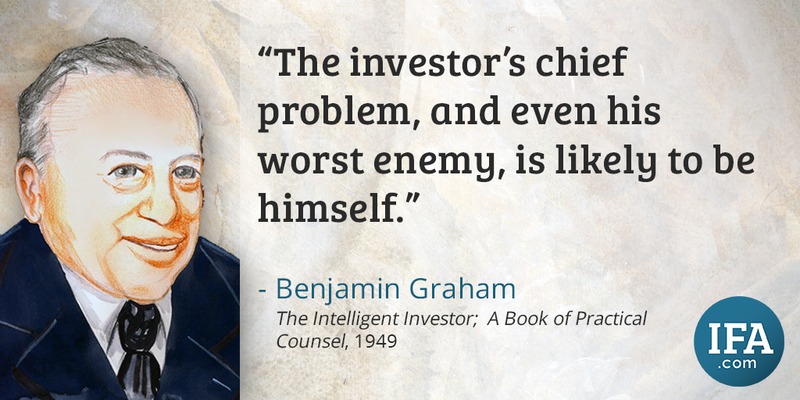 The perils of active investing have been well chronicled throughout history. In fact, nearly 300 years ago, a Dutch pictorial book titled "Het Groote Tafereel der Dwaasheid," or "The Great Mirror of Folly" painstakingly portrayed the fates that befell investors who heavily speculated as the world's first major stock market crash unfolded. In the late 1600s, stock exchanges were formed in Amsterdam, Paris and London to bring together buyers and sellers of shares, mostly in companies relating to trade, banking and insurance centered on maritime expansion in the East and West Indies and along the Mississippi River. 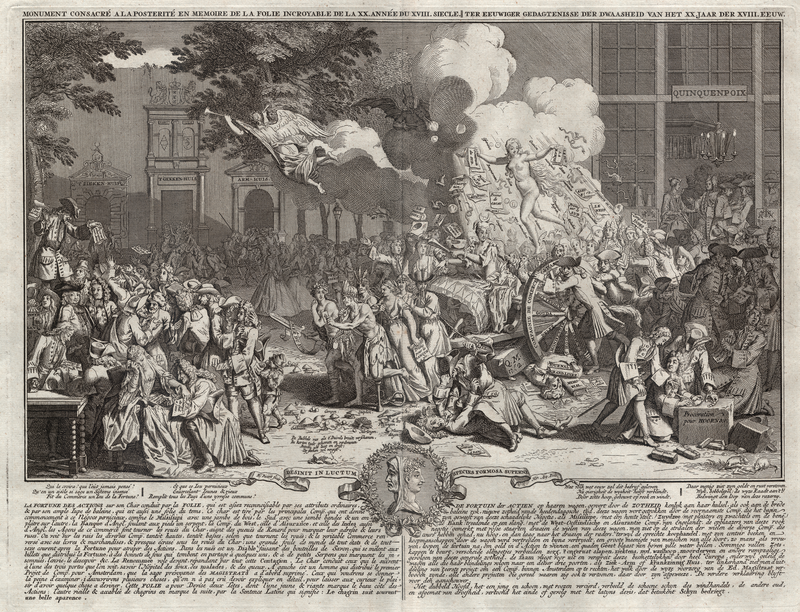 The "Tafereel" depicts the promise and ultimate financial devastation experienced by the many investors who became swept up in the allure of amassing quick fortunes in the stock market or "wind trade." The book includes approximately 79 copper engravings that tell the tales of hope, hype, speculation and devastation. It represents stockbrokers as harlequins or sly foxes and investors as frantic and crazed gamblers. I recently discovered the "Tafereel", and asked Lala Ragimov to recreate a particularly poignant scene titled: "Monument Consecrated to Posterity in Memory of the Unbelievable Folly of the 20th Year of the 18th Century." 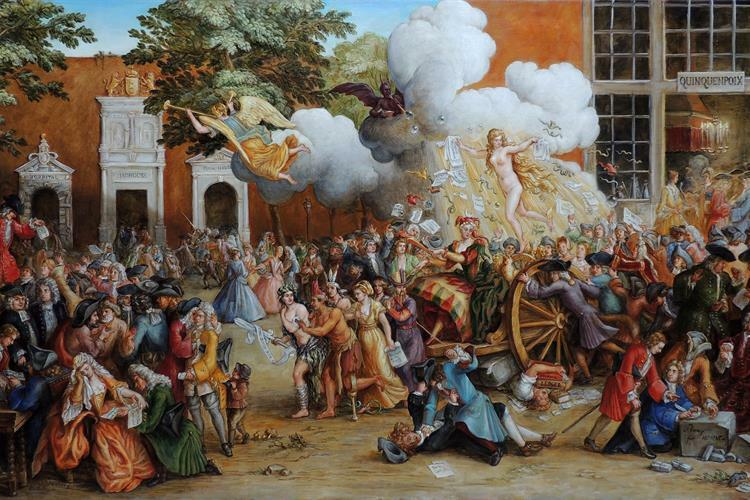 The scene depicts a street in Amsterdam that had erupted into a trading frenzy. 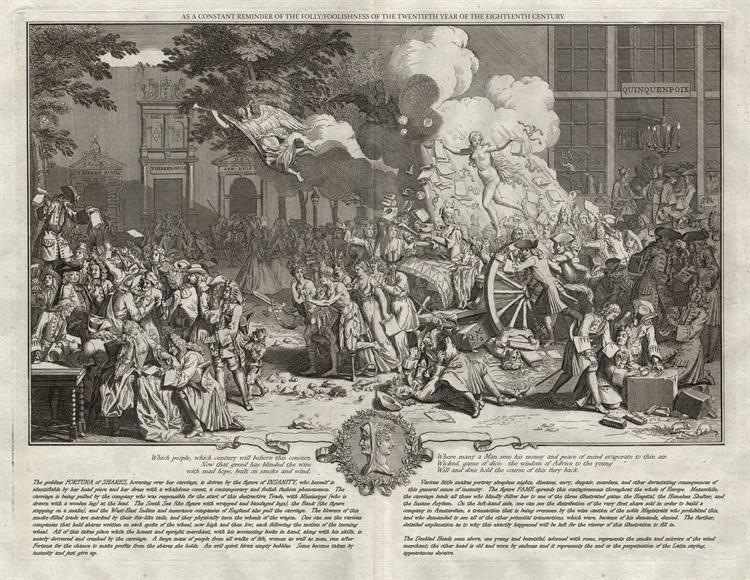 At the Quinquenpoix coffee shop, overflow trading became the norm because the exchange had become too crowded with traders manically trading to gain quick wealth. At the scene's center, a cart is being pulled by characterizations of the bubble stocks of the time, including companies like the South Sea Company, the Dutch East Indies Company, and the West Indies Company, a banking company and an insurance company. 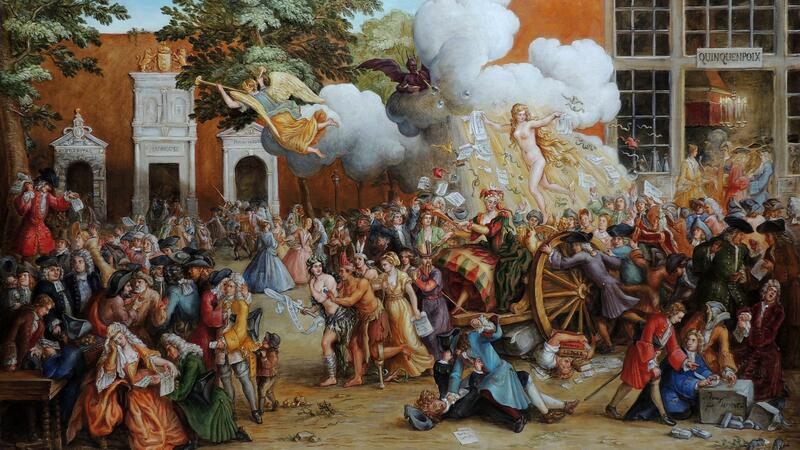 Driving the cart is Lady Insanity, while the Goddess Fortuna floats above, dropping stock certificates littered with snakes, while the devil blows bubbles in the air. Meanwhile, Lady Fame slowly, but assuredly, leads the cart to one of three destinations: the hospital, the mad house, or the poor house. 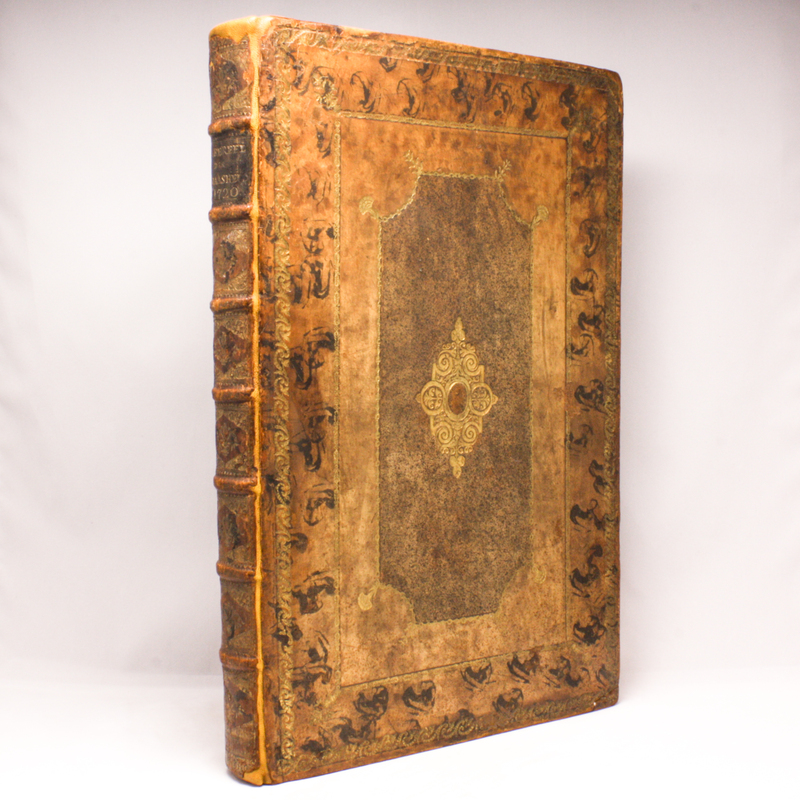 I bring this important book and painting to light because they reveal that the same powerful lessons learned in 1720 are still being taught today to investors who speculate in the stock market. Stock market returns are compensation for bearing risk. Higher expected returns require higher risk. Therefore, investors should take on as much risk as they have the capacity to hold — their risk capacity. One of the most effective ways to determine risk capacity is to examine five distinct dimensions: an investor's time horizon and liquidity needs, investment knowledge, attitude toward risk, net income, and net worth. This is explained more fully in Steps 10 and 11. 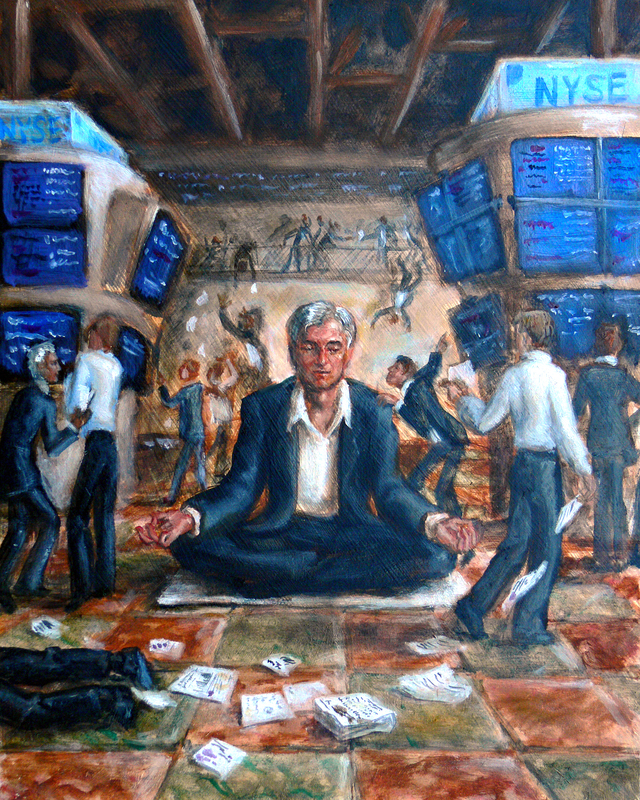 Advisors who play an active role in emotions management can be referred to as “passive advisors.” These knowledgeable advisors help maximize investor success by providing the critical discipline required to combat emotional reactions like pulling out of the market the way so many did in the downturn that occurred in 2008 to early 2009. 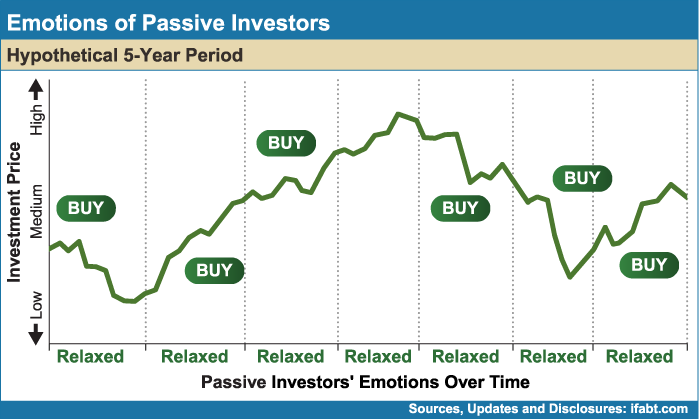 Passive advisors not only help to manage investors’ emotions, they are fiduciary stewards of their clients’ wealth. 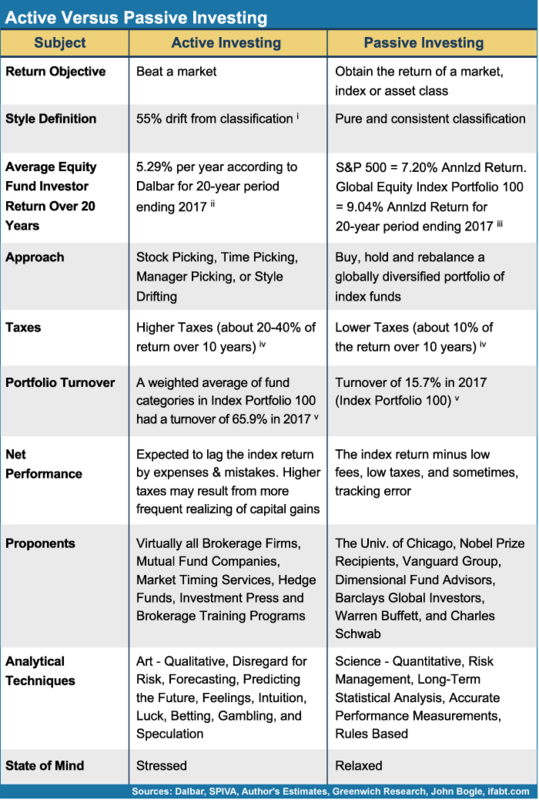 Figure 1-6 is a compilation of 20 data points from 15 similar studies that sought to determine the success of the average investor at capturing mutual fund or benchmark portfolio returns. The studies include investors who were following or not following the advice of a passive advisor. Since they leave intuition and forecasting out of their decision making process, passive advisors are also referred to as evidence-based advisors. 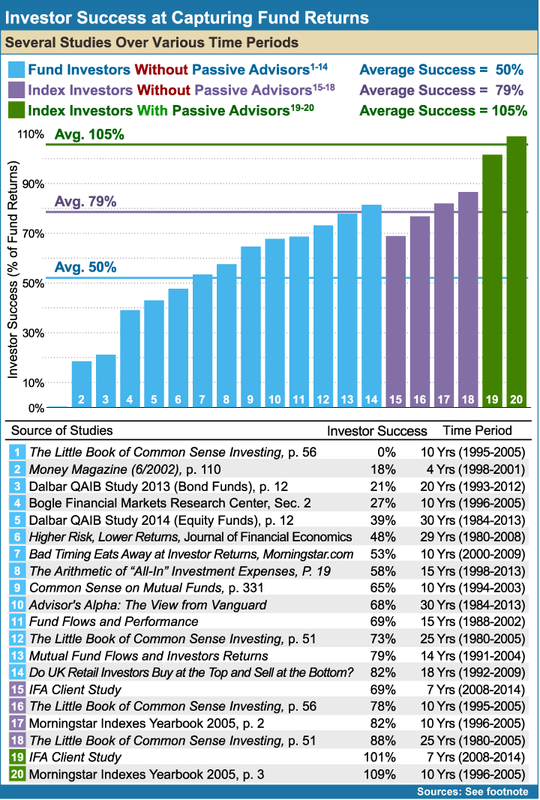 Within Figure 1-6, the blue bars indicate that the average mutual fund investor, without the advice of a passive advisor, captured only an average of 50% of fund returns. The purple bars represent investors who invested in index funds, but did not follow the advice of a passive advisor. On average, they captured 80% of the returns of various index funds. Possible explanations might include the failure to rebalance asset allocations during market turbulence, the delay of investing when cash is available, the inability to stay invested during rocky markets, or the failure to heed the ongoing advice of their passive advisor. Don Phillips was the Managing Director of Morningstar when that report was issued. He summarized his findings this way: “Consider the success Dimensional Fund Advisors has had in selling its funds through advisors who undergo training on the merits of passive investing and in portfolio construction theory. Consider that over the past decade the dollar-weighted return of all index funds was just 82% of the time-weighted return investors could have gotten with those funds. Yet, the figures for Dimensional are much better. In fact, the dollar-weighted returns of Dimensional funds over the past 10 years are actually higher than their time-weighted returns, suggesting advisors who use Dimensional encourage very smart behavior among their clients, even buying more out-of-favor segments of the market and riding them up, rather than buying at the peak and riding the trend down, which is usually the case with fund investors.”12 The findings of the Morningstar report are shown in Figure 1-7. Knowledgeable passive advisors help their clients stay invested and rebalance throughout market turbulence. Such behavior enables these investors to maximize their ability to capture returns and provides justification for the right advisor. Many investors are lured into do-it-yourself indexing through index funds and exchange-traded funds (ETFs). This is a step in the right direction, but without an advisor, I would estimate that those investors have not experienced the full value of passive indexing. Quality passive advisors offer valuable services, such as rebalancing, tax loss harvesting, a glide path strategy, and other wealth management tools that, in my experience, are rarely properly applied by do-it-yourself investors. Step 12 provides more information on these topics. Homer’s legendary story about Ulysses (Greek name Odysseus) tying himself to the mast to avoid destruction can be aptly applied to investing. 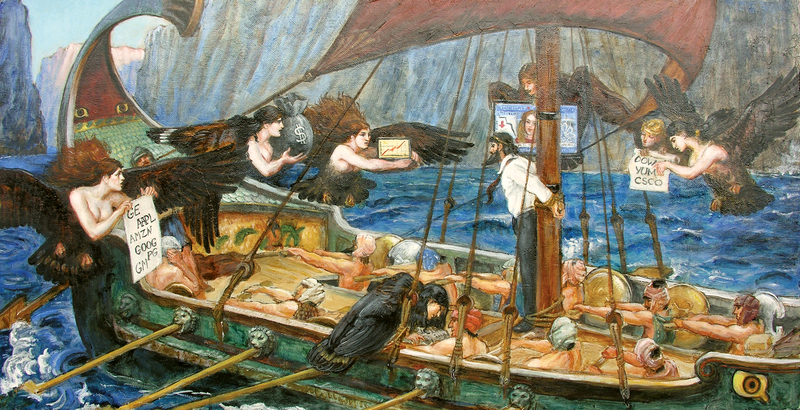 Ulysses was able to hear the alluring siren songs without being led to his demise, because he made an agreement with his seafaring crew as they approached the sirens. He ordered them to plug their ears with wax and keep him tied to the mast despite his protests and cries. Under no circumstances were they to untie him. 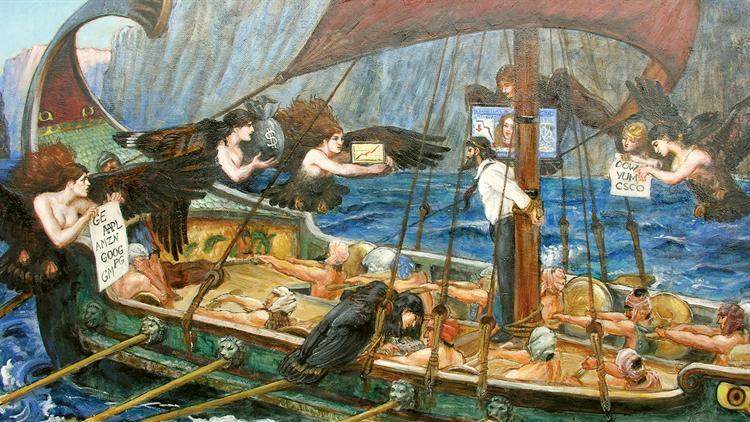 Ulysses desperately tried to break free upon hearing the sirens, but the men kept their promise, and the entire crew sailed safely through danger. They all worked together to strategically prevent their own demise. 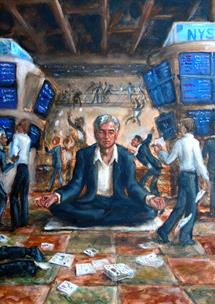 The lure and noise of the financial media often drive the behaviors and decisions of investors. A Ulysses Pact is like an investment policy statement, a proactive and strategic agreement that is made between a client and advisor. An advisor can guide clients through the murky or turbulent waters and ensure they don’t jump ship in response to the noise by signing a Ulysses Pact. This pact allows investors to agree up front that they will not act on emotions that can lead to irrational and wealth-destroying decisions. It can serve as a promise to one’s future self to follow a passive advisor’s counsel to hold on and not buy or sell as a reflexive reaction to the short-term gyrations of the market. 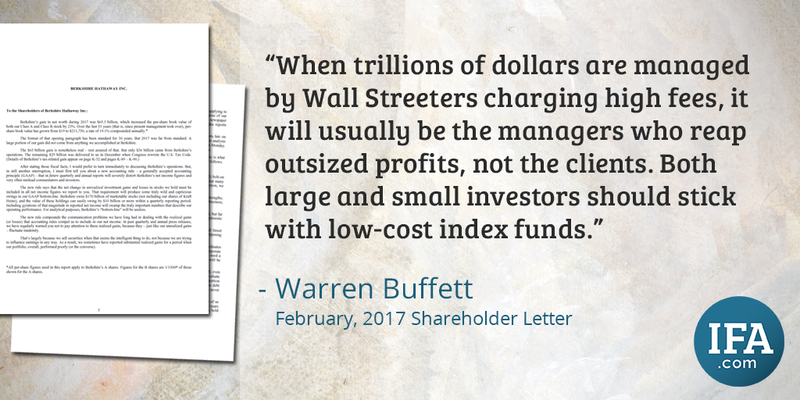 Buffett not only advocates index funds, he’s betting on them. The June 2008 issue of Fortune15 Magazine reported that Buffett wagered a million dollars that an S&P 500 index fund’s ensuing 10-year returns would beat those of five actively managed funds or hedge funds chosen by Protege Partners, a prominent New York-based asset management firm. Citing the Wall Street Journal, Buffet’s hand picked S&P 500 index fund compounded an annual return of 7.1% compared to the basket of funds selected by Protégé Partners, which returned 2.1% from January 2008 through December 2017. An interesting note, Protégé Partners hedge fund manager Ted Seides, who accepted the wager with Warren Buffett, admitted defeat almost eight months in advance of the December 31, 2017 end date. i. Standard and Poor’s Index Versus Active Scorecard as of 6/30/2013, p. 5.
iv. Bogle, John C. The Little Book of Common Sense Investing: The Only Way to Guarantee Your Fair Share of Market Returns. Hoboken, NJ: John Wiley & Sons, 2009, chapter 6, p. 60-68.
v. Internal calculations performed by Index Fund Advisors using data from Morningstar Direct. 3James Montier, The Little Book of Behavioral Investing: How Not to Be Your Own Worst Enemy (Hoboken: John Wiley & Sons, Inc., 2010). 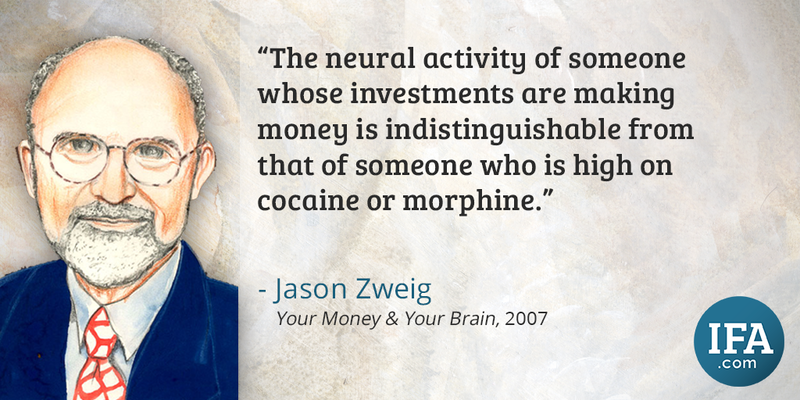 4Jason Zweig, Your Money and Your Brain (NY: Simon & Schuster, 2007). 6 Dr. Ian Ayres, Dr. Peter Ayton, Dr. Greg B. Davies, Dr. Barbara Fasolo, Professor Thorsten Hens, Sheena Iyenger, Dr. Annie Koh, Dr. Neil Stewart, Rory Sutherland, and Dr. Chun Xia, "Risk and Rules: The Role of Control in Financial Decision Making," Barclays Wealth Insights, vol. 13 (2011). 7Dalbar, Inc., "2018 Quantitative Analysis of Investor Behavior," (2018). i. John C. Bogle, The Little Book of Common Sense Investing: the Only Way to Guarantee Your Fair Share of Market Returns. Hoboken, NJ: John Wiley & Sons, 2007. 56. Print. ii. Jason Zweig, "What Fund Investors Really Need To Know. Our exclusive study of mutual fund returns shows which ones really made money for investors and which ones took shareholder for a costly ride." CNNMoney - Business, Financial and Personal Finance News. June 1, 2002. Web. 14 Nov. 2011.
iii. Dalbar. "Helping Investors Change Behavior to Capture Alpha." Quantitative Analysis of Investor Behavior. April 2013. 12. http://www.qaib.com/. iv. John C. Bogle, "Bogle Financial Markets Research Center." Vanguard - Mutual Funds, IRAs, ETFs, 401(k) Plans, and More. 8 Jan. 2010. Web. 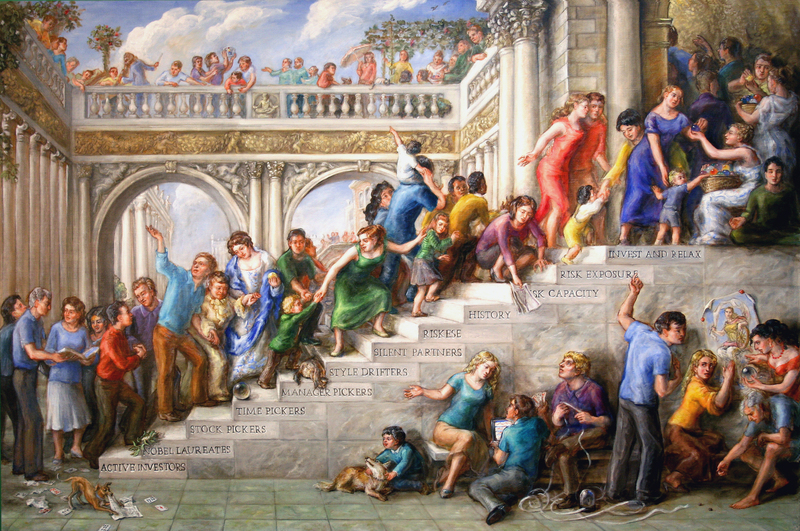 14 Nov. 2011. http://vanguard.com/bogle_site/sp20071015.html. vi. Russell Kinnel, "Bad Timing Eats Away at Investor Returns." Morningstar. 15 Feb. 2010. Web. 14 Nov. 2011. http://news.morningstar.com/articlenet/article.aspx?id=325664. viii. Dalbar. "Helping Investors Change Behavior to Capture Alpha." Quantitative Analysis of Investor Behavior. April 2013. 12. http://www.qaib.com/. ix. John C. Bogle, "Common Sense on Mutual Funds." Hoboken, NJ: Wiley, 2010. 331. Print. xii. John C. Bogle, "The Little Book of Common Sense Investing: the Only Way to Guarantee Your Fair Share of Market Returns." Hoboken, NJ: John Wiley & Sons, 2007. 51. Print. xiii. Geoffrey C. Friesen, Travis R. A. Sapp. "Mutual fund flows and investor returns: An empirical examination of fund investor timing ability." University of Nebraska - Lincoln. 1 Sept. 2007.
xvi. John C. Bogle, "The Little Book of Common Sense Investing: the Only Way to Guarantee Your Fair Share of Market Returns." Hoboken, NJ: John Wiley & Sons, 2007. 56. Print. xvii.Morningstar. "Morningstar Index Yearbook 2005." Morningstar, 12 May 2006. Web. 14 Nov. 2011. 2. http://indexes.morningstar.com/Index/PDF/MorningstarIndexesYearbook2005.pdf. xviii. John C. Bogle, "The Little Book of Common Sense Investing: the Only Way to Guarantee Your Fair Share of Market Returns." Hoboken, NJ: John Wiley & Sons, 2007. 51. Print. xxii. Morningstar. "Morningstar Index Yearbook 2005." Morningstar, 12 May 2006. Web. 14 Nov. 2011. 3. http://indexes.morningstar.com/Index/PDF/MorningstarIndexesYearbook2005.pdf. 11The 109% figure that was calculated in the Morningstar study occurred during a period when there was a high benefit to rebalancing. The 109% applied to individual mutual funds only and would not be applicable to the return shown for a portfolio of mutual funds across different asset classes. 12Sanjay Arya, John Coumarianos, Pat Dorsey, Russel Kinnel, Don Phillips, Tricia Rothschild, "Morningstar Indexes Yearbook,” Morningstar, Inc., vol. 2 (2005). 15Carol J. Loomis, "Buffet's Big Bet," Fortune, June 23, 2008. 16Charles Schwab, Charles Schwab's Guide to Financial Independence: Simple Solutions for Busy People (New York: Three Rivers Press, 1998). 17David Swensen, Unconventional Success: A Fundamental Approach to Personal Investment (New York: Free Press, 2005). 18Swensen, Pioneering Portfolio Management: An Unconventional Approach to Institutional Investment. 19David Swensen, "The Mutual Fund Merry-go-Round," New York Times (New York, NY), Aug. 13, 2011.